Bon Appetit Wednesday! Seaweed for Thanksgiving? In the past we’ve discussed several ancient superfoods including quinoa, amaranth, honey and even the adzuki bean. Today, we add one more to the list—seaweed, an ancient food from the sea that packs a punch nutritionally, but is often unappreciated by the uninitiated. Not everyone loves seaweed, but maybe they should! 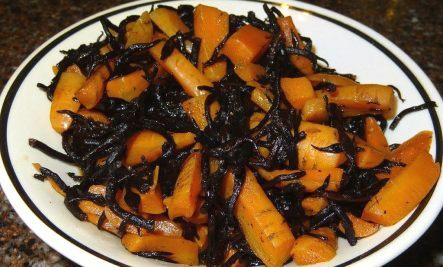 Today’s recipe, Carrots with Arame, is an unexpected pairing that will help you bring seaweed to the Thanksgiving table. But first, let’s make sure you can explain to your guests the history behind your curious contribution to the holiday feast. Seaweed has been eaten for centuries in ancient civilizations all over the world. It is actually an algae of which there are numerous edible varieties, so it has flourished as a food resource in many different cultures. In Japan today, 21 species of seaweed are used daily in the cuisine and six of those are said to have been in use since the 8th century CE. Nori, the most popular type of seaweed eaten in Japan, was mentioned in the Taiho Ritsuryo, the earliest book on Japanese governance, written in 701 CE. In China, seaweed has long been a revered food item to be served to kings and esteemed guests. In 600 BCE, the Chinese writer Sze Teu penned, “Some algae are a delicacy fit for the most honoured guests, even for the King himself.” An even earlier reference is included in the Chinese Book of Poetry, which was written between 800-600 BCE. While you may already know about seaweed’s prominent place in Asian cuisine, you may be surprised to find that it is also a traditional food in Ireland and Scotland. In fact, it has been a dietary staple for those living on the coast in the Western British Isles for at least 4,000 years. The earliest reference to its use as a food is from a poem by Saint Columba from Donegal, dated to 563 CE. There are several different types of seaweed that have been eaten for generations in these areas and today it is common to refer to these foods as “sea vegetables.” A red seaweed called dulse is “traditionally eaten with oatmeal in a thick broth or served boiled and tossed in butter.” Today, dulse is mainly eaten only after it has been dried. Carrageen moss is another extremely popular seaweed, but instead of being eaten on its own, it has been used for hundreds of years as a food additive. Centuries ago, coastal dwellers would gather it and dry it in the sun. It could then be stored for as long as was necessary. In order to use it in a recipe, they would simply soak it in warm milk or water at which point it would release a “delicate, natural gel that acts as a setting agent when the mixture cools.” Today, carrageenan is used all over the world as a thickening agent. It is actually the subject of various studies attempting to prove that it causes cancer and should not be ingested. When the body is saturated with natural iodine from seaweed, it will more readily excrete radioactive iodine taken in from the air, water or food. This prevents radiation poisoning of the thyroid (see other radiation benefits below). Seaweed contain 14 times more calcium by weight than milk. Seaweed is high in protein, low in fat and contains little or no carbohydrates. Seaweed has components that lower blood pressure, prevent arteriosclerosis and combat tumors. Seaweed has been on earth at least 500 million years longer than man. This Thanksgiving, why not bring a dish from the sea packed with nutrients and rich with history? And while you’re at it, don’t forget to give thanks to the ancients for their culinary ingenuity. Soak arame for 10 minutes. Boil arame, tamari and grated ginger uncovered and on low until most of the liquid has evaporated. Cover and cook until carrots are slightly tender. Remove lid and cook until all the water has evaporated. Reavis, R. (2012, May 3). Nori – Japan’s Most Famous Seaweed: Part I, History and Traditional Use | Glendale Community College Blog. Seaweed.ie :: Use of seaweed as food in Ireland. 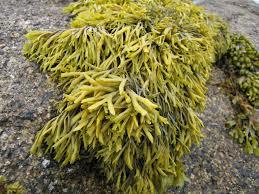 Ireland: Carrageen Moss Blancmange. (n.d.). Retrieved November 9, 2014. Prevent Radiation Poisoning with Seaweed – an Ancient Powerfood. (n.d.). Retrieved November 9, 2014. This entry was posted in Blog, Bon Appetit Wednesday, Culinary, Culture, Healing Arts, Recipes With a Past, Science and Technology and tagged ancient food, ancient history, ancient recipes, ancient seaweed, AntiquityNOW, Bon Appetit Wednesday, edible algae, health benefits of seaweed. Bookmark the permalink.